Students at Enchanted Care Learning Center and Enchanted Care Kids Campus in Delaware celebrated Earth Day by visiting residents at The Inn at Olentangy Trail on Friday morning. During their visit, students released thousands of ladybugs back into the environment by placing them on plants, flowers and trees. Kindergarten student Zachary Hartman, red sunglasses, shows his teacher, Lauren Farley, far right, two ladybugs making their way up his arm. https://www.delgazette.com/wp-content/uploads/sites/40/2018/04/web1_Ladybug.jpgStudents at Enchanted Care Learning Center and Enchanted Care Kids Campus in Delaware celebrated Earth Day by visiting residents at The Inn at Olentangy Trail on Friday morning. During their visit, students released thousands of ladybugs back into the environment by placing them on plants, flowers and trees. 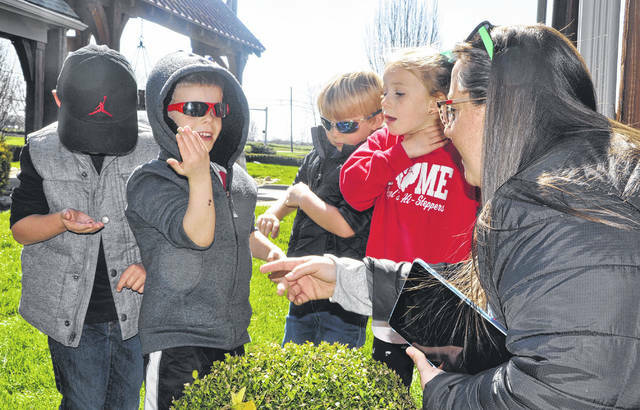 Kindergarten student Zachary Hartman, red sunglasses, shows his teacher, Lauren Farley, far right, two ladybugs making their way up his arm.